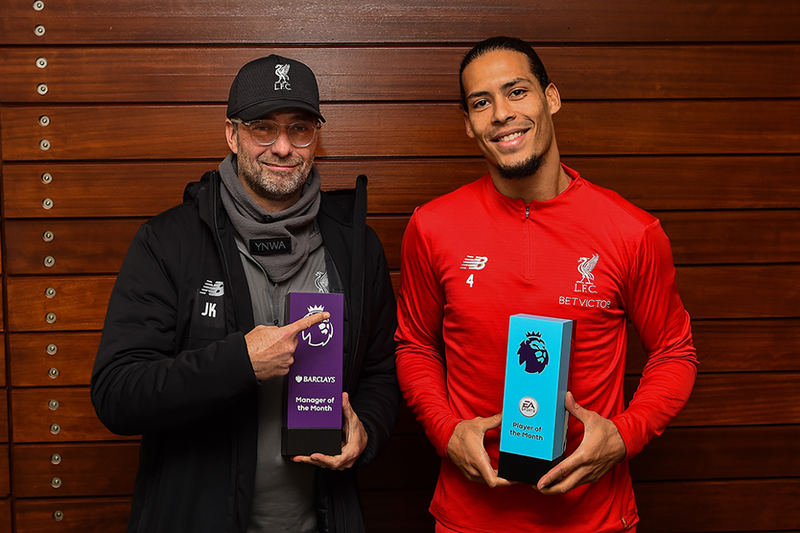 Liverpool celebrated a December awards double as Jurgen Klopp was named the Barclays Manager of the Month and Virgil van Dijk won the EA SPORTS Player of the Month prize. Klopp claimed the Barclays award for the second time after guiding his side to victory in all of their seven Premier League matches, with a league-high 22 goals scored and only three conceded. "It’s nice, the icing on the cake," said Klopp, whose first award came in September 2016. "It was a very successful but difficult month. "Each game felt like the most important one of the season. It was unbelievable. The intensity was massive but that's what made it a special month." As to the basis of Liverpool's perfect record in December, Klopp pointed to the support from his staff. "One hundred per cent teamwork," he said. "I know a few things about football but my best skill is to bring really good people together. "I lead that group, that's true, and I have to make final decisions but I can only make good decisions if the information I get is brilliant. "With the group I have here, if you can mix up the potential of the group with the best attitude you can get, you get quality. That's what we did in December." The German won the award ahead of Nuno Espirito Santo, Manuel Pellegrini, Mauricio Pochettino and Maurizio Sarri. Van Dijk claimed the EA SPORTS award for the first time. Indeed, he is the first defender to be named Player of the Month since Jan Vertonghen in March 2013. "It was a fantastic month for us," he said. "Some great games and I have enjoyed every bit of it." The Dutchman was chosen ahead of fellow nominees Felipe Anderson, Eden Hazard, Harry Kane, Marcus Rashford, Mohamed Salah and Son Heung-min.